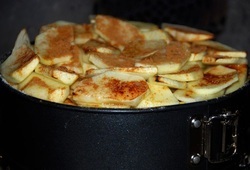 This is an old Irish recipe using an Irish soda bread base, topped with apples, sugar and cinamon. Obviously years ago they would not have had ring bound tins to bake the cake in and would just have used a pan above an open fire but we have found that using the ring bound tin makes it easier to keep the apple topping in place. You should note that once the buttermilk hits the flour and baking soda mix in the bowl the raising reaction starts very quickly and speed is of the essence in getting it into the oven almost immediately. To aid the needed speed, the apples must be peeled and sliced FIRST. Stop them discolouring by putting the slices into a bowl and sprinkling with the juice of half a lemon. You should also note that with Irish Bread the secret not only is speed but as little handling as possible. 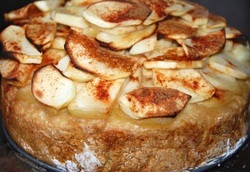 Once the Irish Apple Cake is cooked and cooled you can cut it into wedges and enjoy one with a big mug of tea or coffee. 2. Peel the apples, quarter and remove the cores. 3. Slice the apple quarters into slices of about half a centimeter. You want them thick enough not to fall apart in the oven but thin enough to cook through. 4. Sprinkle lemon juice over the sliced apples to stop them browning. 5. Grease the inside of the spring bound tin. 6. Measure the flour and add the baking soda and salt to the weighed flour and sift into the mixing bowl. 7. Add about three quarters of the buttermilk and mix through quickly with the dessert spoon. 8. If needed, add more of the buttermilk. You do not want the mix to be too wet. 9. Bind the mix together QUICKLY using your hands. 10. Sprinkle a little flour on your work surface and QUICKLY fashion dough into a circle and place in the greased spring bound tin. 11. 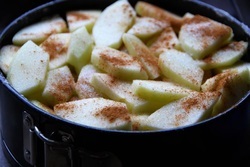 Arrange one layer of the sliced apples on top of the dough and lightly sprinkle with sugar and cinamon. 12. Repeat #11 twice more until the apples reach to top of the ring bound tin. 13. Put into oven for 10 minutes. After 10 minutes turn oven down to 180c/350f/gas mark 4 for a further 25 to 30 minutes until the apples are just golden. 14. Remove from the oven and allow to cool a little. 15. Slide the palette knife around the tin between the cake and the tin to loosen. 16. Carefully release the spring on the tin and place the cake onto the wire cooling rack and slide the palette knife under the cake to remove the base of the tin. Allow to cool thoroughly. 17. Make a pot of tea and get ready to enjoy with a wedge of your Irish Apple Cake!